Cate and Chloe launched on Amazon in 2017 and quickly has become one of the best selling jewelry brands on Amazon. Now the company is looking to continue to growth with its beautiful 2018 fashion jewelry collection. 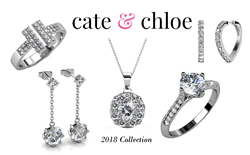 The popular new jewelry brand Cate & Chloe just had their largest holiday shopping season 2017 yet in the company’s history, with multiple styles that sold out not once but twice! This gave the designers a more defined direction of what the Cate & Chloe woman wants in her fashion wardrobe and the new 2018 Collection was born. This collection features the highest quality of genuine Swarovski jewels or AAA grade Cubic Zirconia crystals in classic diamond shaped bracelets, uniquely tiered pendants, eye catching earrings and rings. Each piece gives women the assurance that this is a piece of excellent quality and will stand the test of time. Designed with the modern woman in mind, each piece is designed with delicate and vintage detailed aesthetics that are a true standard addition to any women’s collection that can easily be transitioned from day to night. These jewelry pieces are the perfect way to add some subtle sparkle to everyone’s wardrobe. Versatility being the key influencer in the new designs, allowing one to pair any of these pieces with a t-shirt and jeans on those casual weekends or with that little black dress you only wear for special occasions. Really you couldn’t have a better accessory on your fashion team. Ruth “Protector” Necklace - White Gold-plated necklace with 8 small Swarovski stones and 1 beautiful larger Swarovski Stone. Chain Length: 16" / extendable to 18". Soak in the compliments while this crystal necklace pendant that features amazing Swarovski crystals, and beautiful gold plating. Kat “Rock Star” Ring - 18k White Gold Plating, Genuine Swarovski Crystal Stones, Stone Count: 33, Round Cut Stone, Sizes: 6, 7, 8, Nickel Free. It’s so versatile you can pair it with a t-shirt and jeans on those casual weekends or with that little black dress you only wear for special occasions.